The federal government has been slow to recognize and respond to the threat of bioterrorism, a new report says. 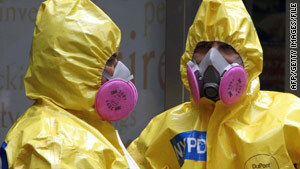 Washington (CNN) -- A commission set up to assess national security measures on Tuesday gave the U.S. government a failing grade in improving response time to a biological attack. "The assessment is not a good one, particularly in the area of biological threats," the report by the Commission on the Prevention of Weapons of Mass Destruction Proliferation and Terrorism said. "While the government has made progress on preventing such attacks, it is simply not paying consistent and urgent attention to the means of responding quickly and effectively so that they no longer constitute a threat of mass destruction," the report said. The government barely got a passing grade on oversight of high-containment laboratories. The commission, headed by Graham, a former Democratic senator from Florida, and Jim Talent, R-Missouri, also gave the government failing grades in congressional oversight and in producing the next generation of security experts. The delayed response to the H1N1 influenza outbreak demonstrated the United States was "woefully behind" in its ability to produce needed vaccinations and treatments rapidly, the commission said. "H1N1 came with months of warning," the commission's report said. "But even with time to prepare, the epidemic peaked before most Americans had access to vaccine. A bioattack will come with no such warning." The commission was set up after Congress passed a bill in 2007 to implement recommendations of the 9/11 Commission. The commission submitted its report with new recommendations in December 2008, predicting that terrorists would use a weapon of mass destruction -- likely biological -- by 2013 unless the global community quickly launched a forceful strategy to prevent it. The report card released Tuesday is a follow-up to that report, called "World at Risk." Congress took its lumps in the report as well, especially on its oversight of national security issues. "Congress has failed to take even the relatively easy first steps to consolidate oversight authority of the Department of Homeland Security," the commission said. "The estimated number of committees and subcommittees that oversee DHS ranges from 82 to 108. Virtually no progress has been made since consolidation was first recommended by the 9/11 Commission in 2004." Both Congress and the administration were faulted for not funding recruitment and training programs for national security experts. The government got an "incomplete" for its work on implementing a comprehensive nuclear policy toward Pakistan -- meaning that not enough time had elapsed to give a grade. Other areas in nuclear proliferation, including working with Russia, got middle-of-the-road grades. "President Obama has undertaken substantial effort to bolster the nonproliferation regime," the commission said. "From his April 2009 speech in Prague to his chairmanship of a United Nations Security Council meeting on the subject and plans for a Global Summit on Nuclear Security, he is attempting to bend current trend lines." But the commission said that it has concerns "regarding the administration's failure to prevent the lapse of verification mechanisms established under the [Strategic Arms Reduction Treaty]. Ensuring their continuation was very important and insufficient attention was paid to it." The commission handed out "A" grades for integration of the National Security and Homeland Security councils, designation of a senior adviser for WMD proliferation and terrorism, and development of a national strategy for bioforensics.